Twitter/@MaxTemkinHQ2 cleanup effort gone wrong. Amazon on the hunt for its next headquarters and shortlisted cities are putting their best foot forward. Chicago, one of the cities included in the running, launched a massive cleanup effort in anticipation of Amazon’s visit to scope out proposed sites. This has backfired after the city accidentally removed a graffiti done by a renowned artist. The race for HQ2 is on. In anticipation of Amazon’s visit to scope out its proposed sites for HQ2 last week, Chicago ramped up efforts to make the city look presentable. According to the Chicago Tribune, city records showed that there was a massive spike in the removal of graffitis near the proposed sites, in the run-up to Amazon’s visit. “In the month leading up to Amazon’s visit, the city completed 233 requests for graffiti removal in the Fulton Market area. All but eight were handled during the seven-day period ending Wednesday, according to city data. During the same month last year, the city handled only 14 graffiti removal requests in that area,” the Chicago Tribune wrote. Cleanup efforts also spiked near to other proposed areas such as Lincoln Yards, where 223 graffiti jobs were completed in a week, compared to two in the same week last year, the Chicago Tribune reported. While this spring clean might have come as blessing for some locals, for others it has been a disaster. 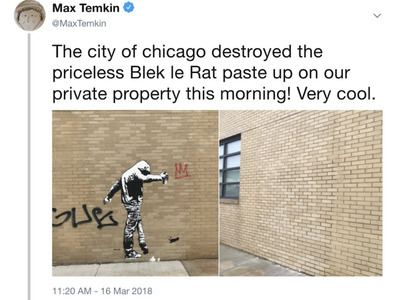 The founder of Cards of Humanity, which has offices in Chicago, across the river from Lincoln Yards, was furious to find out that a graffiti artwork on its building, which was done by French street artist Blek le Rat, was accidentally removed in the cleanup. “The city of Chicago destroyed the priceless Blek le Rat paste up on our private property this morning! Very cool,” founder Max Temkin tweeted earlier this month. Temkin has allowed the artist to do the artwork to promote his show at a Chicago gallery a year ago. Since then, it had been protected by the city. “We felt pretty bad, and apologised as soon as we found out what happened,” Chicago Alderman Brian Hopkins told the Chicago Tribune. 11 out of 15 of the US’s dirtiest cities are in the running for HQ2, including New York, Philadelphia, Boston, and Miami. These cities have not yet confirmed what it being done to clean up in preparation. Amazon said it plans to invest over $US5 billion and accommodate as many as 50,000 high-paying jobs, making it one of the largest corporate-civic giveaways in modern American history. Read more about their proposals here.